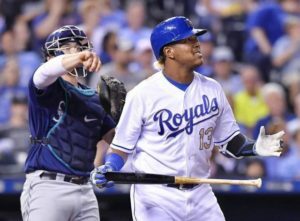 Royals All-Star catcher and fan favorite Salvador Perez recently went on the disabled list for an “intercostal strain.” As of now, he’s on the 10-day disabled list. At first glance, you might be thinking, “C’mon Salvy, it’s a rib muscle! How serious can it be?” So what’s the deal with intercostal strains? 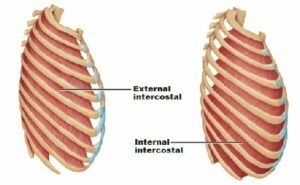 Quite simply, the intercostals are muscles that run between the ribs and act to elevate the ribs during normal breathing. When they expand and relax, they move the chest wall to allow the lungs to expand. These can be injured in many ways. Sometimes, a violent cough or sneeze can do it! However, it sounds like Salvador Perez swung on a strikeout and caused the injury. Certainly, an awkward throw or twist could cause the muscle to strain. Heck, he could easily strain the intercostals during one of his infamous “Salvy Splashes” lifting those coolers! Why are intercostal strains a problem? The reason why these are a problem are twofold. One, they are painful. These muscles can’t rest! They are moving with every breath you take. Intercostals are not like the hamstrings or a hip flexor that you might strain. You can support them with wrapping and avoid running or aggravating activities. However, we can’t put a cast or supportive wrapping on the ribs – you’ll suffocate! The second reason is that these just take time to heal. Like rib injuries and abdominal oblique injuries, these just need time that athletes often don’t have. What’s the rehab of intercostal strains look like? For the most part, rehab is just watching the clock. Pain is managed with medications, possibly a steroid injection to take the edge off. Things like heat, cold, ultrasound, laser, and electrical stimulation won’t do much here either. With intercostal strains, you just have to rest until the pain subsides, then you can get back at it as tolerated. We’re sure Salvy will be back soon to finish out the race for the division title and hopefully much more than that. While there’s not much we can do at SSOR to treat intercostal strains, we’re experts at figuring out what you have going on if you come see us for an injury. Make no mistake, if you need to see a doctor, we’ll make sure we make that happen for you. It would be a privilege to serve you and partner with you in your care. Give us a call!